On Monday 3 July I was completing my final preparations to depart the next day for London to Annepont, France. One of my best friends, Mandy Barton was getting married and I was honoured to be invited as one of her bridesmaids. Whilst planning Powered by Me, I often considered not including international travel in the challenge. Yet, whilst learning more about cycling and talking to others about their own experiences, everyone always said how wonderful it was to cycle in France. I was told, ‘the roads are so smooth, people give you lots of room and that people were exceptionally respectful of cyclists.’ I didn’t want to miss out on the opportunity to travel Powered by Me to another country and when a fellow blogger and endurance cyclist, Kieron Ramsay agreed to ride with me to Annepont (and back), it was a done deal. My final preparations helped to get me in the right frame of mind. One of the biggest challenges was to fit everything I needed into a 6L capacity Apidura bag that fitted in my bike frame. I managed to fit most items, but of course had to ditch a lot. And almost all items were for eventualities. Things I’d rather not carry on a 1,600km ride, but I needed ‘in case of…’ It was doable, as I gave one of the other bridesmaids another bag to take to the wedding with my dress, shoes and makeup. There was no way I was cycling 1,600km with that! When Kieron arrived and I saw his bags, I also had nothing to complain about. Kieron was riding with around 30 + kgs of weight on his bike (panniers) and in a large backpack (the type you take to go hiking or travelling). The difference was, Kieron was using our ride as a test for his bike European cycle trip, so he literally had everything he was planning on taking for 2-3 months; tent, sleeping bag, spare clothes, spare bikes parts and more, good effort! The entire route to the wedding and back was a big one. The biggest and most badass ride I had ever planned and contemplated. I was a lucky lady to have Kieron ride with me. He is more experienced, knows way more about bikes and is perhaps one of the most positive and happy-go-lucky people I have ever met. The total ride was going to be just under 800km one way (and including the ferry crossing from Portsmouth to Caen which unfortunately I wasn’t able to travel human-powered, maybe next time). Once the entire route was planned using the fab app Ride with GPS, I then broke it down to 4 days one way, to cycle on average 150-ish km a day with no more than 1,600m elevation daily. It was then a case of finding cheap Air BnB’s to stay in as close to the end of each day’s cycle was possible, just to make sure we had a hot shower and a good bed for the night! Rather than write a long-winded blog post about our first day’s riding to Annepont, covering London to Caen, I’ve decided to illustrate it in the form of a poem. Enjoy! No thrills just the grills. Turn the corner and we’re in no sound. No way, a ferry crossing you ask? How long does it take to get to Ports-mouth? The Thames widens and the wind stops blowing. We left fuelled up and ready for more. Pedal, Pedal, Pedal, what a good feeling. Caen was calling, legs down for the night, as we set sail on our float. 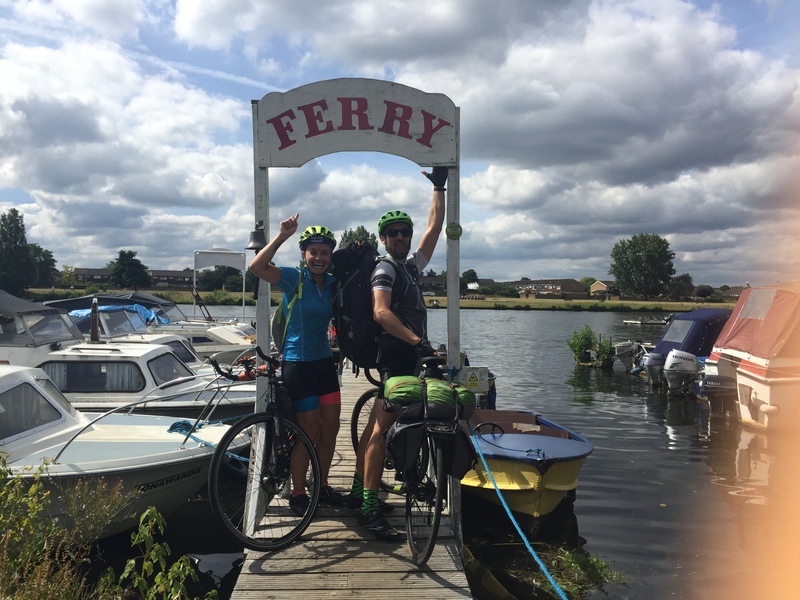 I was thrilled to have completed day 1 of 1 in England with a friend by my side to experience it all the way, knowing that first thing in the morning, we would wake up in France and really begin the adventure. Click here to read Kieron Ramsay’s blog write up on 1 + 1 = a couple of freaks on a bike.